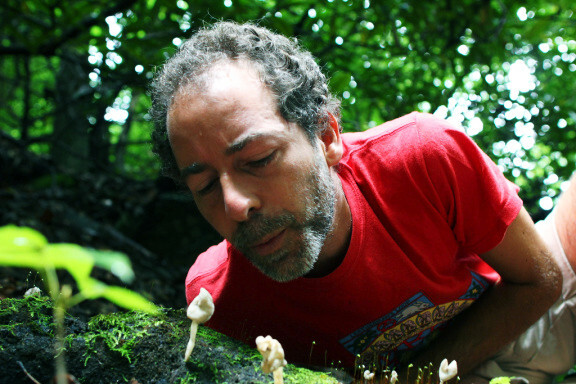 Alan Muskat is like a bounty hunter – of mushrooms. Picture him like Keira Knightley a la Domino Harvey while reading...and hear what he has to say, because it's pretty cool. This isn't a joke. A young man my family knew in Illinois, also a working mushroom expert,died one day — a seemingly healthy guy. I still firmly believe it had something to do with mushrooms. That's an anecdote. I hear those all the time, and only a fraction of them ever even happened. Of the ones that did, you don't know the true cause. Most people don't just die from one thing but are already compromised from years of poor diet, unhealthy lifestyle, etc. Are you ever concerned about the risks of your job? If mushrooms were really so dangerous, humans would have already learned the hard way and either stopped eating them or gone extinct.I think it's riskier to NOT eat wild foods; see here. What is the best mushroom for cooking each: seafood, beef, chicken and vegetarian food? There is no best mushroom for anything. I pick over fifty different varieties every year and each tastes different each time, so it's difficult to have a favorite. Besides, "foragers can't be choosers" and the whole point of foraging is diversity. I use whatever I have fresh on hand. Like you, I too learned a well known university education means nothing anymore. What qualifies one to be a mushroom expert, as there is no degree for it? Survival! Actually, there are mushroom expert certification programs. They just started one in South Carolina that teaches you twenty mushrooms in two days. However, expecting to learn mushrooms in a crash course like that is like thinking you can learn a language in a week. You can't mushroom hunting, a foreign language, or any skill from a book or even from another person. It takes time and practice. That said, the world is full of mushroom experts, and many of them are under eight years old. They've already had plenty of practice. They know only half a dozen species and they leave the rest alone. I only know a couple hundred of the 3,000 species in my area, and 90% of the time I gather the same ten. When it comes to foraging, being an expert is not about knowing a lot; it’s about being careful. Amateurs can easily avoid the deadly species and mycologists can easily get poisoned. Most of us are expert drivers, yet anyone can have a moment of carelessness. Being safe is also about knowing your limits. You have to recognize and admit what you don't know. You have to leave your ego out of it. When in doubt, throw it out, or your body will do it for you! Actually, you don't need to throw it out, and it's the reason even children can be experts. There is only one word people need to remember in order to mushroom hunt safely. It's the only thing they need to do when they are not sure if what they have is edible. It's a verb with three letters. It's not eat, try, run, see, or die. It has nothing to do with looking it up, whether in a book or on the internet. DIY is DUM. The word is ASK. If you're not sure, ask someone. Ask a human being. The only "field guide" worth having has two legs. How do you know when you're ready to declare yourself employable? Going from a young mushroom student to true master mushroom expert, if we can compare mushroom knowledge to The Karate Kid films? The Karate Kid had a mentor, and that is THE way to learn any skill. The mentor can help determine when the student has "graduated." How does the mentor know? Well, the course mentioned above has a final exam. But don't worry: it's pass/fail, if you know what I mean (just kidding). If all the mushrooms were out at once, I could graduate someone in less than a month. They are actually spread out over six months, so it depends on how many the student wants to know. Like I said, you only need to know ten; for my area, here's my list. What goes on in your year of harvesting and drying mushrooms for sale? Would most people be bored, excited or like most careers, a bit of both emotions, in your occupation? I can't speak for most people, but I can guess that most people would rather be in the woods hunting mushrooms than sitting at a desk, working in a factory, or waiting on customers. I don't gather to sell anymore. I now train others to do it, and I train teachers as well. But I did it for fifteen years, and the only tedious part was calling around to sell to restaurants. I didn't have a steady enough supply to have steady customers. Now I advocate for a centralized, cooperative "clearinghouse" system, and I'm training children to gather for it. This isn't "child labor," it's lucrative self-employment. Kids set their own hours and make $10-20 USD/hour, which is better than most adults. The initiative is called "The Afikomen Project." As far as I know, it's the first foraging public education program in the world. Let's say I one day feel like strolling around for mushrooms, Goldilocks stylin', picnic basket, bears and the works. How do I know which mushrooms are dangerous based on looking at them? Could you pick out your mother in a crowd? If you said yes, it's surely because she is familiar, literally, to you. Can you tell cabbage from iceberg lettuce? If you said yes, did you learn that in school? Did your parents ever sit you down and explain it to you? Mushrooms are no different. Grow up with them, spend time with them, and they are easy to recognize. You can't learn it from a book and I can't just explain it to you. Trying to do both would do more harm than good. Only practice makes perfect. If I find them anywhere near a city, does that mean I probably should not eat them as pollution contaminates them? Not necessarily. Some mushrooms concentrate toxins more than others. It also depends on the distance from a major road. Both those things you can ascertain. But it also depends on the history of that location. Heavy metals don't go away, and mushrooms love to soak them up. I don't know the answer. But I do know that you can be sure that the produce you buy in the store, unless it's labeled organic, and often even when it is, has been intentionally sprayed with poison. And whenever you eat at a restaurant, since very few use any organic ingredients, you can be sure those are full of poison too. Did you know that Round Up is routinely sprayed directly onto conventional crops to serve as a dessicant? Even if you gather mushrooms in what looks like pristine woods, pollution is everywhere. A few years after Chernobyl, there was a statistical rise in thyroid cancer in Connecticut. A cloud of radiation rained on them. As individuals, we cannot escape what we've done and continue to do as a species. We are trashing the planet and living in our own sewage dump. Focusing to saving yourself only perpetuates the rampant individualism that got us here in the first place. For more of more of an answer than you bargained for, see my guide to healthy eating. Real question: were you a big fan of the Super Mario games as a child? In particular, the mushrooms? No. I did play Atari, though, and even started with "Pong." But I'm showing my age!